Good news for everyone that as tried and liked the 3Dfier DirectShow filter that is producing very good realtime 2D to 3D video conversion. We are going to have a version of the filter meant for 3D Vision – providing side by side stereo pairs from a single 2D video input to be used in either Nvidia’s 3D Vision Player or the Stereoscopic Player. This version should be available in the next few weeks with a price of $25, meanwhile if you still haven’t tried the demo version of the filter you should do so. There is a time limited 10 minute demos of the filter for both anaglyph and side by side conversion with the anaglyph version not looking as good as with the side by side one. 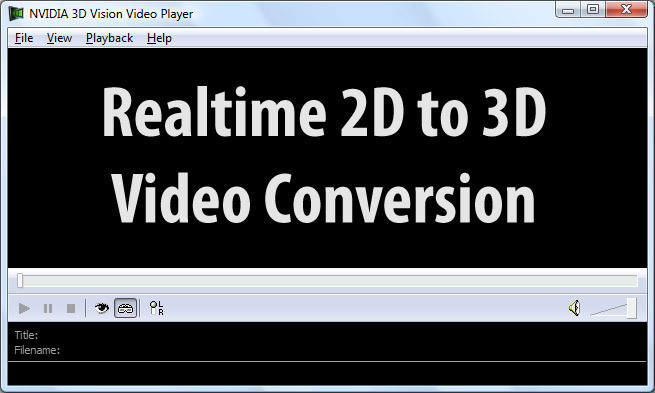 You can also check my guides on how to use 3Dfier for: Impressive Realtime 2D to 3D Video Conversion for 3D Vision and Realtime 2D to Stereoscopic 3D Conversion from Live TV Source. Have in mind that the results you’ll get vary on a lot of factors and at the end you still won’t get as much as when playing back video that was shot in stereo 3D, but still with the lack of much 3D content so far this is worth trying. Due to the recent intensive inquiries of purchasing end user version of 3Dfier for Stereoscopic Player, we are working on a side-by-side version that will be sold at the price of $25. This version is intended to work with Sterescopic Player only. We would start to take order in these weeks. Please bear with us a bit. Thanks very much for your interests in 3Dfier product and appreciate your patience with us. We hope to deliver to you the best converted 3D experience at most affordable price to help you extend the capabilities of the 3D display devices you have invested in. Will 3D Vision Surround also be able to work without the 3D part and just show games like Eyefinity? Sorry, but this software is a piece of crap. Take a videoclip, add some noise and delete first 3-5 pics, will have better 3D-like result as 3Dfied. Very bad depth effect, near zero.